Bord na Móna Growise Orchid Potting Mix is not suitable for ericaceous plants such as Rhododendrons, Azaleas and Camellias. For this group of plants you should use Bord na Móna Growise Ericaceous Compost. Orchids like a lot of air around their roots and a low nutrient environment. This product has been specifically formulated to provide these conditions and will sustain orchids for many months. Once flowering, use a specialist orchid fertiliser following manufacturer’s instructions. 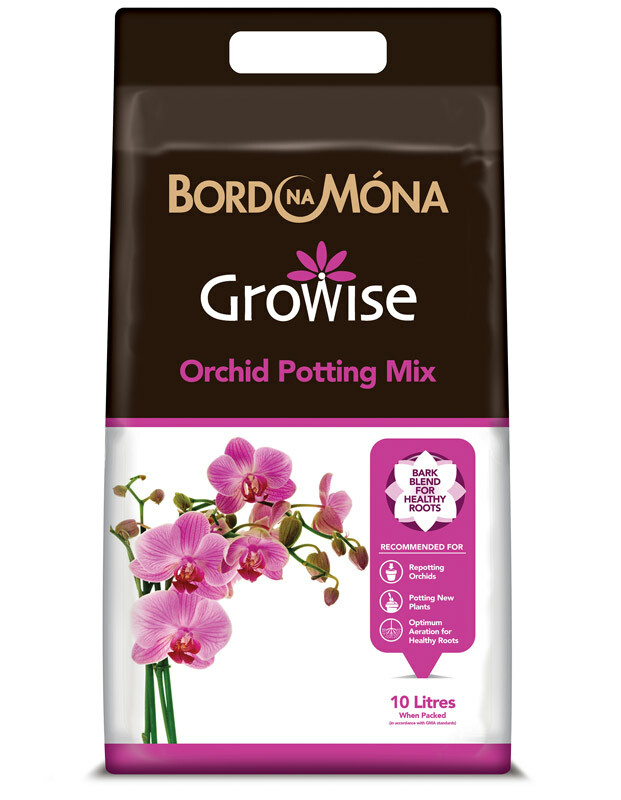 Bord na Móna Growise Orchid Potting Mix is made from selected bark and perlite to ensure a lot of air around the roots and optimum moisture holding environment for orchids. It contains a low level of nutrients to ensure flowering and protect roots. Bord na Móna Growise Orchid Potting Mix is ideal for many orchid species including Phalaenopsis, Vanda, Ascocenda, Cattleya, Oncidium, Brassia, Dendrobium, Paphiopedilum, Miltonia, Cymbidium, Odontoglossum, and many others grown indoors. Orchids benefit from repotting every year to rejuvenate and encourage vigorous growth and beautiful flowers. Repotting should be done prior to the growth phase, ideally in late winter, early spring or autumn. Repotting during hot weather is not suitable as plants tend to dry out causing undue plant stress. Prepare the plant by watering in advance of repotting. This will help remove the plant from the pot. Take a suitable pot (some orchids prefer clear or transparent pots) for repotting. 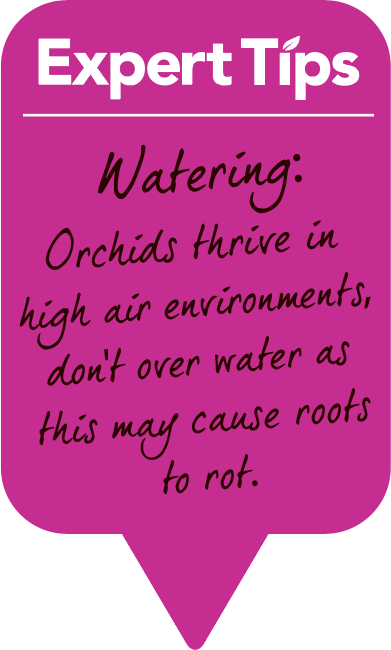 Orchids love a lot of air around the roots so ensure there are adequate holes in the pot for air and drainage. Place a layer of Bord na Móna Growise Orchid Potting Mix at the bottom of the new pot. Gently squeeze the existing pot, place a hand at the base of the plant, palm side down and turn the pot upside down. Gently tap the bottom of the pot to remove the plant. Remove all of the old compost and tease apart roots. Rinsing the roots may help dislodge any stubborn compost. With a sharp knife cut off any roots that appear damaged. Gently place the plant into the new pot and hold in place in the centre of the pot. Add Bord na Móna Growise Orchid Potting Mix around the plant taking care not to damage roots. Shake the pot gently to fill any large spaces. Do not firm in as this may restrict roots. Allow the plant a few days to acclimatise in its new environment before watering.